Contrasting finals in the 10th European Individual Squash Championships saw the men’s title retained by Thierry Lincou – extending French ‘ownership’ of the trophy to seven years – and the women’s crown regained by England’s Jenny Duncalf at the Tennis & Squash Centre inSaarbrucken, Germany. Top seed Duncalf, the European Individual champion in 2006 and 2007, arrived in Germany following three confidence-shaking defeats to lower-ranked opponents in the European Team Championships France. And the world No2 from Harrogate immediately took a two-game lead against one of those victors, Dutch star Vanessa Atkinson, the 34-year-old former world number one now in the twilight of her career and ranked 11 places lower than Duncalf. But Atkinson, a 3/4 seed who reached the final for the second year in a row after despatching second seed Camille Serme, battled back to win the third game and survive a tie-break fourth to level the match. However, 27-year-old Duncalf reclaimed the advantage and closed out the match 11-8, 11-5, 9-11, 10-12, 11-5 to win her third tile – and extend her unbeaten run in the event to 12 matches. It was clear that the men’s final may not be the all-French classic which the Saarbrucken crowd were hoping for. Defending champion Thierry Lincou, the No2 seed, faced national rivalGregory Gaultier, the top seed who was appearing in the climax for the seventh year in a row, after winning the title on five of those occasions. The Gallic duo have been fierce rivals throughout their careers – and their tournament head-to-head tally was delicately poised on 11 wins apiece on the eve of the match. But Gaultier, the 27-year-old world No6 from Aix-en-Provence, suffered a twisted ankle during his semi-final victory over Hungarian Mark Krajcsak – and despite a hospital examination which showed no serious damage, but just bruising, it was never likely that the former champion would be 100% for the climax. 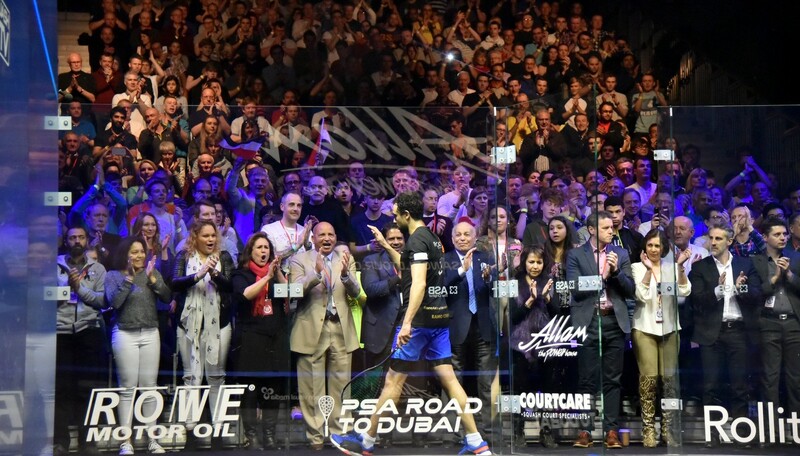 The favourite matched Lincou until midway through the first game – but the title-holder pressed home his advantage thereafter. Gaultier conceded after the second game, leaving Lincou the 11-5, 11-2 (ret.) winner. It was the third time the two Frenchman had battled for the title in the final – and the second title triumph for Lincou, the 34-year-old world No8 from Marseille. Thierry Lincou (FRA) bt  Gregory Gaultier (FRA) 11-5, 11-2 ret. 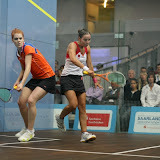 Dutch champion Vanessa Atkinson dashed Camille Serme’s hopes of reaching the women’s European Individual Squash Championship final for the first time when she upset the second seed in the semi-finals of the 10th staging of the European Squash Federation event at the Tennis & Squash Centre in Saarbrucken, Germany. Former champion Atkinson, a 3/4 seed but a finalist in both her previous appearances in the championships, recovered from a game down to overcome the fast-rising French star 6-11, 11-8, 11-4, 11-4. Atkinson, the world champion in 2004 and European champion the following year, lost to Serme in the qualifying rounds in last month’s European Team Championships in France – but came back to beat the 21-year-old world No10 in the final to lead Netherlands to a first-time title triumph in the event. The 34-year-old from The Hague, but now based in the UK, will face Jenny Duncalf, the top seed who is also celebrating her third successive appearance in the final. Duncalf, the world No2 from Harrogate and champion in 2006 and 2007, prevailed in an all-English clash with Tania Bailey, beating the 5/8 seed 11-2, 11-9, 12-10. The men’s climax promises a mouth-watering all-French clash – and a repeat of the last two years’ finals – between top seed Gregory Gaultier and defending champion Thierry Lincou. The Gallic duo have been fierce rivals throughout their careers – and their tournament head-to-head tally is delicately poised on 11 wins apiece as they prepare to do battle for the 2010 European crown! Gaultier, the five-time champion from Aix-en-Provence, reached the final for the seventh successive year when he beat Hungary’s 9/16 seed Mark Krajcsak 11-5, 11-5, 11-7. Lincou, the former world champion from Marseille who is looking for his second European title, fought off ‘Flying Finn’ Olli Tuominen, defeating the 5/8 seed from Helsinki 12-10, 11-9, 11-2. Mark Krajcsak, a 9/16 seed, became the first ever Hungarian to reach the semi-finals of the European Individual Squash Championships when he beat France’s Gregoire Marche in the men’s quarter-finals in the 10th staging of the European Squash Federation event at the Tennis & Squash Centre in Saarbrucken, Germany. The 26-year-old from Budapest made his breakthrough in the last 16 round, upsetting experienced Frenchman Renan Lavigne, a 5/8 seed ranked 31 in the world, 11-6, 6-11, 11-6, 2-11, 11-7. Later in the day, world No46 Krajcsak had enough in reserve to defeat fellow 9/16 seed Gregoire Marche 11-9, 11-4, 11-7. Marche, the 20-year-old world No83 from Aix-en-Provence, had earlier pulled off the biggest upset in the men’s event by beating England’s 3/4 seed Jonathan Kemp – ranked 21 in the world – 11-7, 3-11, 11-5, 7-11, 11-5. Krajcsak now faces top seed Gregory Gaultier, the five times winner of the title who is expected to reach the final for the seventh year in a row. Gaultier despatched Swiss star Nicolas Mueller11-7, 11-3, 11-6. Defending champion Thierry Lincou will contest the other semi against surprise opponent Olli Tuominen. Second-seeded Frenchman Lincou ended domestic interest in the event by overcoming Germany’s 5/8 seed Simon Rosner 11-5, 14-12, 11-9, while flying Finn Tuominen, a 5/8 seed, upset Dutchman Laurens Jan Anjema, a 3/4 seed and a semi-finalist the last two years, 8-11, 11-5, 11-7, 11-8. England’s Tania Bailey claimed an unexpected place in the last four of the women’s event after upsetting France’s 3/4 seed Isabelle Stoehr, the 2008 champion, 11-8, 11-7, 11-0. Bailey, a former world No4 who has now slipped to 33 in the rankings after a series of injury woes, will now face England team-mate Jenny Duncalf, the top seed. Duncalf, winner of the title in 2006 and 2007, crushed Dutch opponent Orla Noom 11-0, 11-2, 11-2. A fierce battle can be expected in the other semi-final between former world champion Vanessa Atkinson and rising French star Camille Serme – who have already faced each other three times before in ESF competitions, with Atkinson 2/1 ahead. Second seed Serme, the 21-year-old world No10 from Paris who is expected to reach the final for the first time, beat Annelize Naude, a 5/8 seed from the Netherlands, 13-11, 11-4, 11-4, while 3/4 seed Atkinson, also from the Netherlands, downed England’s Dominique Lloyd-Walter 11-9, 11-8, 11-8.